This is from a Nigella Lawson recipe (Praised Chicken – sort of a poached/braised chicken). 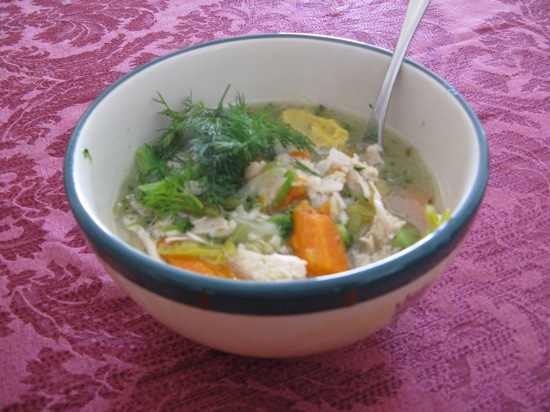 It makes a rich and fairly quick chicken soup. It’s absolutely delicious, the broth gels wonderfully and the addition of mustard and dill are fantastic. It’s easy and very nutritious too. You can serve it with some basmati brown rice – put it in the bowl first and ladle the stew on top – or with some nice homemade bread on the side. If you don’t have leeks, you can easily substitute a roughly chopped organic onion. On a washable board, un-truss the chicken, put it breast-side down, and press down until you hear the breastbone crack. Then press down again, so that the chicken is flattened slightly. Put the oil in a large, flame-safe cooking pot (with a lid) in which the chicken can fit snugly: mine is about 11 inches wide by 4 inches deep. Heat the oil over medium heat and add the chicken, breast side down. Brown the chicken for a few minutes, then raise the heat and turn the chicken over. Add the wine or vermouth and let it bubble down a little before adding the leeks, carrots, and celery. Pour in enough cold water to cover the chicken, though the very top of it may poke out. Add the herbs and the parsley stalks or sprigs along with the salt and red peppercorns or a good grinding of regular pepper. The chicken should be almost completely submerged by now and if not, do add some more cold water. You want it just about covered, but still a few inches below the top of your pot. Bring to a boil, clamp on the lid, turn the heat to very low, and let cook for 1 1/2 hours, or 1 hour 40 minutes. Remove the pot from the heat and let stand, covered, for 20 to 30 minutes. Sprinkle the chicken with parsley leaves. If you’re serving with rice, put a scoop in the bottom of your bowl, then add chicken, veggies and broth. Put a spoonful of mustard (horseradish mustard works great) and as much fresh dill as you like. Serve and enjoy! You can buy Nigella’s Kitchen at Amazon, link below. I like your blog! Interesting information. I think I will try this recipe — it looks good and tasty! Sometimes the chicken is just bland…but the leeks and mustard really must add a lot of flavor! It is really good. The fresh dill and mustard add a lot of flavor and organic chicken makes a difference too.